Prepare for some adventures that take you far away from Hope County. Far Cry 5 has a pretty eclectic collection of content coming post-launch. The newly announced Arcade mode will be introducing new assets that could potentially come from other games, but the single-player campaign will see its share of additions as well. We already know post-launch DLC will include zombies, Martians, and Viet Cong, but now we can see them in action in the latest trailer from Ubisoft. The gameplay for these three adventures looks just as ridiculous as it sounds. Hours of Darkness and Lost on Mars seem like single-player campaigns, while Dead Living Zombies pits you and some friends against seven waves of shambling monsters. The new trailer also showed some live event gameplay teased in the Arcade Mode reveal trailer. “Friendly Fire” and “Pickup Blowout” look like a couple of events for players to tackle while playing through the main campaign’s open world, but we’ll update with more information as it is made available. 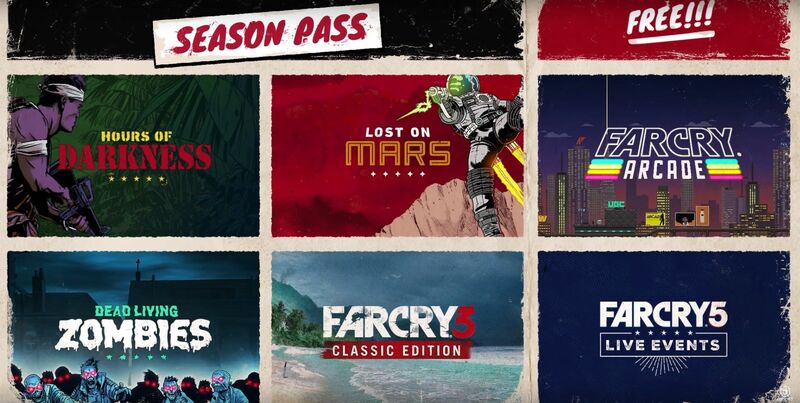 Purchasing the season pass for Far Cry 5 nets you access to the three expansions from the trailer and a digital copy of Far Cry 3 Classic Edition. These things in addition to the base campaign and Far Cry Arcade means many hours will be burned when Far Cry 5 launches March 27, 2018, on PS4, Xbox One, and PC. Also, check out a few of the other most anticipated games alongside Far Cry 5.